Elizabeth Vaughan has worked in the early childhood field for over thirty years. She has taught preschool special education in the public schools and has worked with children ages three to six years in child care and university laboratory school settings. She received her PhD from the University of South Florida and currently chairs the teacher education department at Shippensburg University. She is the coauthor of Learning Centers for Child-Centered Classrooms, published by the National Education Association. She is the president of the Pennsylvania Association for the Education of Young Children and serves on the NAEYC Affiliate Council. By enhancing the block play in your classroom, you can help children acquire the emerging skills they need -- with numbers, vocabulary, and reading -- for kindergarten readiness. 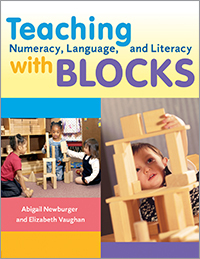 Newburger and Vaughan provide a theoretical foundation describing why and how to use blocks, and give guidance on selecting blocks and block safety.